Despite potentially relevant chemical differences between filtered and boiled coffee, this study is the first to investigate consumption in relation to the risk of incident cancer. Subjects were from the Västerbotten Intervention Project (64,603 participants, including 3,034 cases), with up to 15 years of follow-up. Hazard ratios (HR) were calculated by multivariate Cox regression. No associations were found for all cancer sites combined, or for prostate or colorectal cancer. For breast cancer, boiled coffee ≥4 versus <1 occasions/day was associated with a reduced risk (HR = 0.52, CI = 0.30–0.88, p trend = 0.247). An increased risk of premenopausal and a reduced risk of postmenopausal breast cancer were found for both total (HRpremenopausal = 1.69, CI = 0.96–2.98, p trend = 0.015, HRpostmenopausal = 0.60, CI = 0.39–0.93, p trend = 0.006) and filtered coffee (HRpremenopausal = 1.76, CI = 1.04–3.00, p trend = 0.045, HRpostmenopausal = 0.52, CI = 0.30–0.88, p trend = 0.045). Boiled coffee was positively associated with the risk of respiratory tract cancer (HR = 1.81, CI = 1.06–3.08, p trend = 0.084), a finding limited to men. Main results for less common cancer types included total coffee in renal cell cancer (HR = 0.30, CI = 0.11–0.79, p trend = 0.009) and boiled coffee in pancreas cancer (HR = 2.51 CI = 1.15–5.50, p trend = 0.006). 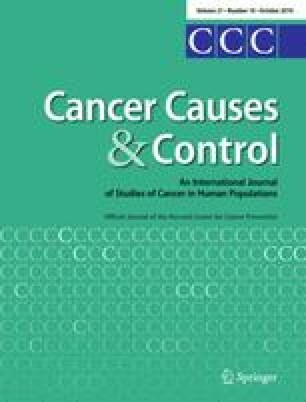 These findings demonstrate, for the first time, the potential relevance of brewing method in investigations of coffee consumption and cancer risk, but they must be confirmed in future studies. This work was supported by the Joint Committee of the Northern Sweden Health Care Region, Västerbotten County Council, the Swedish Research Council, the Swedish Council for Working Life and Social Research, the Cancer Research Foundation in Northern Sweden and HELGA/Nordforsk. The authors would like to thank the participants in the Västerbotten Intervention Project cohorts. Thanks also to statistician Robert Johansson, Oncologic Centre, University Hospital of Northern Sweden, for excellent statistical support, as well as Professor Anna Winkvist, Department of Clinical Nutrition, University of Gothenburg, for valuable advice concerning the diet database, and Anna-Sara Molin and John Hutilainen, Medical Biobank, Umeå University, for skillful technical assistance.